A navy regular Jason Chee Weng Fai, 29, has reportedly lost both legs and an arm in a shipboard accident on Monday. 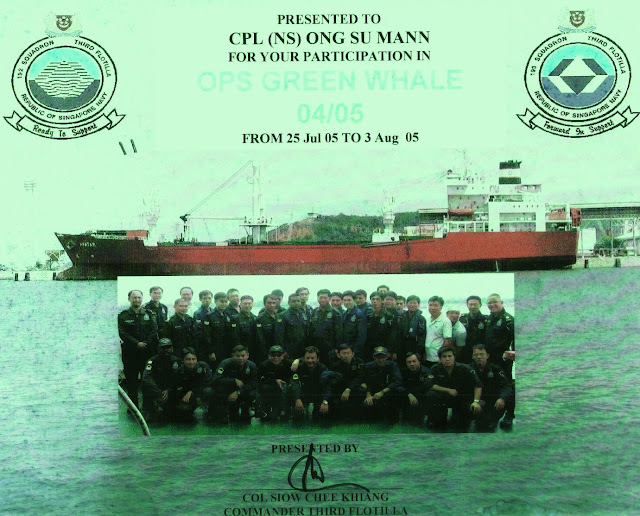 He was doing a routine check on the berthing ropes on the quarterdeck of a landing ship tank (LST) when he was caught between a motorised winch and a rope. For you landlubbers, quarterdeck is usually at the back of the ship. According to The Straits Times: "The area where he got hurt is one of the riskiest areas on board the landing ship tank. Former navy servicemen described the warship's quarterdeck as 'crammed' and 'slippery'." Yes, the quarterdeck can be a dangerous place. 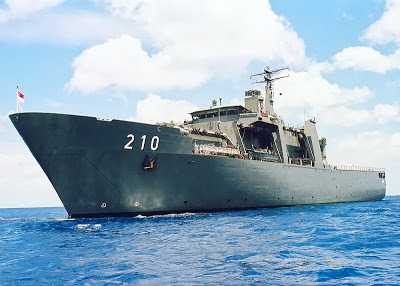 I was in the navy during my national service, though I have never worked in the new (to me) LSTs, but I've worked on the quarterdeck of other big ships during my in-camp training. For some reason, even though I was a medic with zero seamanship training, I was usually assigned to assist the crew in handling the ropes on the quarterdeck when the ship was slipping off or going alongside. You have to be very careful where you stand or you can get caught in the ropes. The trouble is there's a lot of waiting around and you may get bored and wander off and unwittingly end up where you shouldn't be. I had one or two close calls. I remember getting yelled at a lot on the quarterdeck. That's why that was the part of my reservist training I hated most. It was also the scariest... well, not counting the time I was asked to "drive" the ship. I've also been on night watch duty on the bridge where I was supposed to look out for vessels in the dark and call out their positions so that the ship wouldn't sail into them. I could barely tell port from starboard. Once again, I wasn't acting blur, but was really blur. So why was I asked to do something I wasn't trained for? Because of all those guys who managed to get out of ICT, there was always not enough hands. And what else do I have to do as a medic onboard except sleep in sick bay all day and occasionally wake up to dispense some paracetamol? I was happy to help out to be part of team, but I was seriously concerned about my safety - and the ship's. I once suggested to an officer during a post-ICT interview that navy medics should also be formally trained in some basic seamanship, but nothing came from it. I suspect it's because officially, medics weren't supposed to be performing the sea duties that I was doing. Fortunately, I haven't been on a quarterdeck since my ROD six years ago. I miss the trips to Thailand, but not getting yelled at. Why would anyone see a movie more than once?